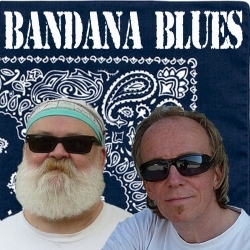 The BANDANA BLUES podcast was founded by Beardo within 3 years into the 21st century. A weekly episode was presented to the world from his location in the subtropics of south-eastern Pennsylvania USA. Soon his long-time Dutch buddy Spinner joined him with musical contributions from the international city of peace and justice in The Netherlands. Beardo & Spinner produced more than 700 shows, most of which are still available for streaming or download at the LibSyn platform. On September 17, 2017 Beardo suddenly, unexpectedly passed away, leaving a big void that can never be filled. BANDANA BLUES, founded by Beardo, hosted by Spinner. The BANDANA BLUES podcast is an independent not-for-profit labour of love and leans heavily on the support of its audience. So please make a donation to help keep the shows in cyberspace available for all.